Griot’s has always been known for offering the best products to pamper your car. Since 1990 they’ve developed, manufactured, and bottled liquid car care products in their U.S. Manufacturing and Distribution Center, ensuring their washes, polishes, waxes, and cleaners are of the finest quality. I just received four products that caught my attention. Check out these impressive products. You will want to add them to your shelf, too. So you just ran your car through the local carwash, and then promptly drove through a puddle on the way home? Yes, it’s frustrating, so here is my suggestion: get Speed Shine® and keep it stocked in your car’s garage. Speed Shine can preserve that “Just Washed” gloss. It’s a fast, safe way to keep any painted surface clean and brilliant; a perfect between-car washes. Speed Shine creates a super-slippery layer of lubrication that gently loosens and lifts dust, pollen, smudges, light grime, and bird bombs off your paint, where they can be safely whisked away. Simply mist Speed Shine onto the surface, gently wipe dry, and buff to a spectacular luster. Speed Shine is safe for all paints and clearcoats and can also be used on trim, wheels, and exterior plastic trim. 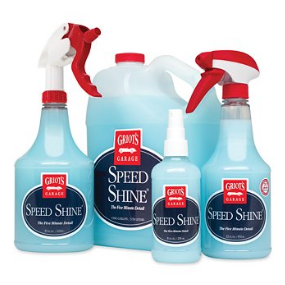 Works best with Griot’s Garage’s blue Microfiber Speed Shine Cloths!